God Has A Way “You Don’t Have To Be Where You Are Right Now” There Is A Way Out. The Total U.S. consumer debt: $2.42 trillion, as of June 2010 (Source: Federal Reserve's G.19 report on consumer credit, August 2010). Total U.S. revolving debt (98 percent of which is made up of credit card debt): $852.6 billion, as of March 2010 (Source: Federal Reserve's G.19 report on consumer credit, March 2010). A new shift toward educating consumers about credit and debt. Kox is Creating Financial Ambassadors in the kingdom. We stand on the promises of God. Come experience this empowering workshop designed to offer practical answers about your Money, Debt and Credit. Don’t continue to go through out life without a plan. Get ready to uncover the veil of credit secrecy. KOX represents great leadership, direction and change. The mission of this organization is to educate, assist, and help consumers rebuild. There are millions of homeowners forced to leave their homes. Consumers do not have the resources necessary that offer a positive direction. Some of us have been taken advantage of as it relates to consumer loans. Have you ever wondered why you work all the time? It is because you are NOT getting ahead. You are merely, paying interest to someone else. 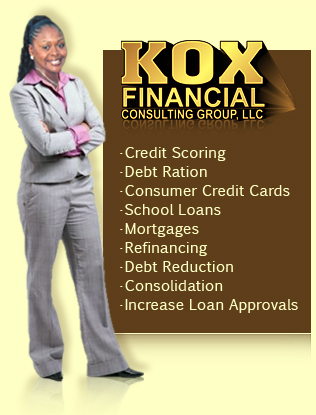 KOX wants to help consumers get away from bad loans that plague our nation through companies. KOX seeks to empower people and change the norm of WORKING FOR NOTHING. 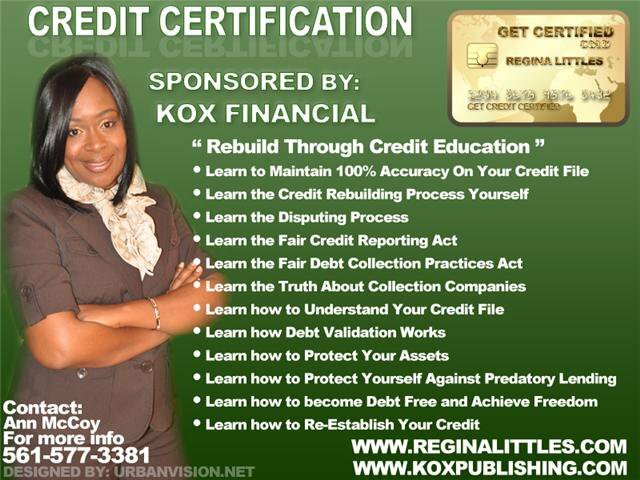 KOX is not a credit repair agency. It is an advocate for consumers in the world of credit and loans. The organization offers you advise and education through workshops and seminars. KOX is a guide for questions and solutions that may help your situation. Regina is considered an expert in this field because she has spent eight years tirelessly studying and researching credit in efforts to provide a better understanding and help those in need. ©2009. www.reginalittles.com. All rights reserved.